Days are getting shorter and the air is getting crisper. While summertime sadness could be creeping in, I’m bursting with excitement as our annual northeast fall road trip is just around the corner! Yes, I’m not afraid to admit it. 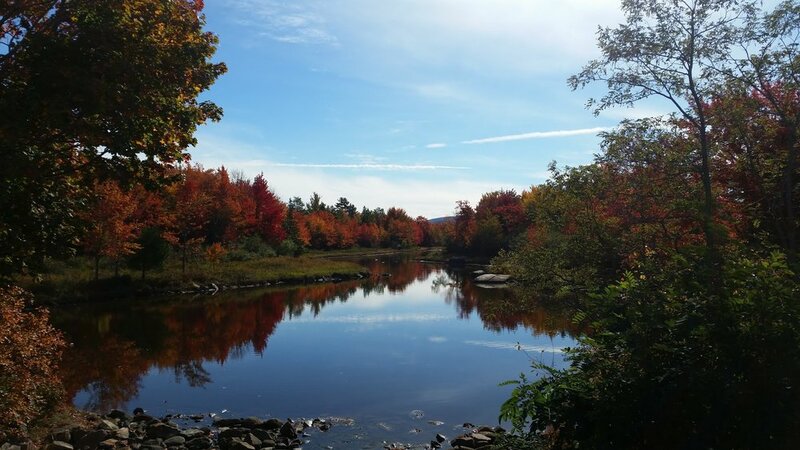 We’re in our 20s and officially “leaf peepers!” Every year, we pack up the car and hit the road to see autumn come to life in the Northeast, with our favorites being Maine and Vermont. This is our fourth year making this week-long trip, and we’ve learned a few essential tips over the years. So grab a cup of hot cider, sink into the couch with your favorite blanket and get ready to find out the best route and four years of wisdom for your trip planning. This is the toughest question and the hardest part about trip planning. Prime time is usually the second or third week of October, but the leaves vary each year. Luckily, there are a few sites that help navigate when to go, like the Vermont Foliage Tracker and Maine Foliage. We’ve used this every year and it hasn’t failed us! Depending on the projections, you’ll either want to start working through Maine and then Vermont or vise versa. However, keep in mind that some small towns along the coast start to shut down mid-October. This itinerary will outline our route through New England, and the route weaves its way through Massachusetts, Maine, New Hampshire and Vermont, highlighting our favorite stops (and a few hidden detours) we’ve found over the years. Boston’s cobblestone streets lead to historical landmarks, trendy restaurants and plenty of brews. 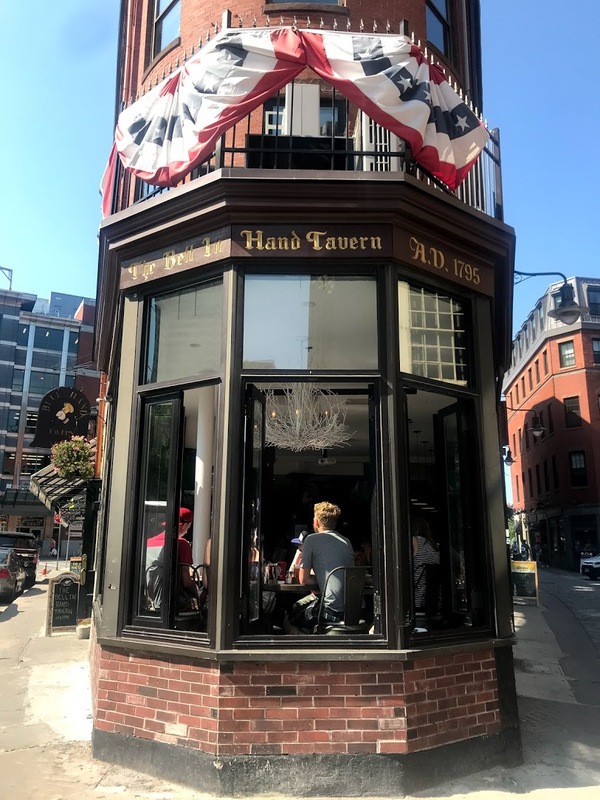 If you’ve been driving all day or just flown in, reward yourself by making your first stop at America’s oldest tavern: Bell in the Hand Tavern. The Tavern has been pouring ales since 1795 and more than 200 years later, they still serve a great pint! 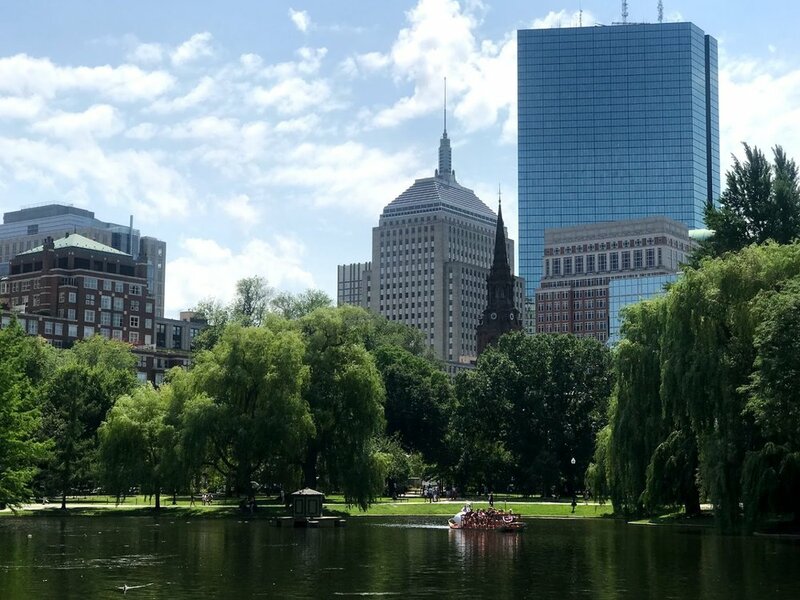 There’s a lot to see in Boston, so after your final cheers, head out onto the streets and follow the Freedom Trail throughout the city to see the main attractions - Paul Revere House, Granary Burying Ground, Old State House, and more. One of the favorite things we did was climb to the top of Bunker Hill Monument. If you’re a beer lover, make a reservation at Sam Adams Brewery - their tour is fun and filled with free samples. If you want to explore more craft brews, check out Trillium Brewery and Northeast Cider. Craft Beer Detour: If you’re a craft beer fanatic, take a detour down to Treehouse Brewery to try their renowned brews. Seriously, this spot has a cult following, and the day we went they had a special beer release and we had to wait more than an hour to get our share of the pours! One of my favorite things about Boston is the incredible cuisine. Don’t skip meals, you’ll regret it. Grab a stacked breakfast sandwich from Mike & Patty’s and don’t miss the best charcuterie and craft beers at The Salty Pig. Drive up the coast and head towards your next stop, Portland, Maine. Portland is mainly a foodie town with charming streets, eclectic shops and breweries scattered throughout. Along-the-Way Detours: Grab breakfast in Salem on your way up to Portland. During October, the town comes alives with haunting decor. Or, check out Kennebunkport. We haven’t explored this coastal town yet, but it’s coastal charm is on our list. If you haven’t had breakfast yet, make your first stop Holy Donuts. These donuts are unlike any we’ve had before - they’re made with potatoes! Trust us, you’ll want an entire box after one bite. As for activities, walk the streets of Old Port and check out Fort Allen Park to see the coastal islands and war memorial monuments. If you’re craving a lobster roll, head to Allagash Brewery for a drink (they give you four free tasters!) and enjoy the best rolls from Bite into Maine that’s attached to the brewery. Fun Fact: Portland, Maine was named after the English Isle of Portland. And Portland, Oregon was named after Portland, Maine...yep, now you have something to share in those awkward silence moments. Overall, Portland is a coastal foodie town with tons of restaurants and breweries to keep you occupied during your stay. This is one of my favorite towns on the East Coast. This isn’t a hidden secret of Maine (this is a popular stop for tourists and cruise ships), but the coastal charm, friendly locals and beautiful scenery makes it a town you can’t pass up. With Acadia National Park just around the corner, this spot also makes my list for one of the top places to hike in the United States. We’ve been here twice now, and we still haven’t seen everything. Sand Beach and Cadillac Mountain are two of my favorite sports in Acadia National Park. We opted to bike the carriage trails in the evening and loved the paved trails and scenic views they offered. See the first sunrise in the U.S.: Drive up to Cadillac Mountain in Bar Harbor to see the first sunrise in the U.S. Get there about an hour or two year, parking fills up fast. For food, don’t miss the best Eggs Benedict at Jeannie’s and blueberry ice cream at Mount Desert Ice Cream. The 6 ½ hour drive to Vermont is long, but beautiful. We decided to make a spontaneous stop pit stop at Mount Washington Observatory, and I’m so glad we did! Driving up the mountain is what I compare to driving on another planet. The landscape changes drastically and the views are incredible. We lucked with the weather during our trip and could see for miles. We kept driving through to get to Vermont, but with so many trails in the area, it would be a fun area to explore! I mean, look at these views! Vermont is one of my favorite states to visit. With small towns, hot cider, cheese shops and endless roads, it’s a state you can’t help but feel cozy and fall in love with. For breakfast, we opted to explore and dine in Montpelier (about a 30 minute drive from Stowe and the capital of Vermont). The Skinny Pancake offered delicious breakfast crepes while Down Home Kitchen provided southern comfort food. There’s so much to see, and our time was split between the main attractions and off-the-beaten trail exploration. If you have a sweet tooth, make Ben & Jerry’s your first stop in the morning. Why? Because (1) you’re an adult and can have ice cream for breakfast and (2) there are no crowds, which makes the experience that much sweeter. Our goal is to always stay one step ahead of the tour buses. Work your way up the main road to Cold Hollow Cider Mill for hot cider, fresh cider donuts and local creations - wine, honey, jams and more. Still hungry? Continue up the road to Cabot Cheese to taste test the different varieties. Or, pack up the snacks and head out for a picnic! What better way to enjoy the fall leaves, right? To see the leaves, we hiked Warren Falls and Von Trappe Family Lodge. Next time, we plan on hitting the trails with our bikes. We also took the time to drive and explore the backroads with no set destination in mind - Exploring the unexpected is part of the adventure! Craft Beer Detour: Hill Farmstead is an hour away from Stowe and offers a beautiful scenic drive and award-winning craft beer. The brewery has been named Best Brewery in Vermont and the U.S. Trust us, the beer lives up to the hype. Also, don’t pass up their barrel aged maple syrup. Stowe is home to one of my favorite restaurants in the world - Hen of the Wood. The restaurant sits in an old mill along the river. With the slate foundation exposed for walls, candle lit atmosphere and incredible food, this restaurant is one you have to book months in advance - and it’s worth the wait. Burlington is an ideal city to spend your last vacation day with shopping, nature, breweries, restaurants and an airport close by. It’s a funky town that sits on Lake Champlain with tons of restaurants and breweries. We spent the day brewery hopping, with Citizen Cider and Zero Gravity being two of my favorites. With casual atmospheres, delicious food (go to Zero Gravity for their pizza) and craft beer/cider, what’s not to love? Walking through the shops on main street or heading to Shelburne Farms are some popular options, but for us, we opted to skip the crowds and drive to explore the area. With Stowe and other small towns being less than an hour away, you could choose to explore more of those areas. We’ve explored south on the 7 and 100 to view more of the scenery and changing of the leaves. On one of our adventures, we found Whistle Pig Distillery, where we received a private tour and tasting from the owner. He even let us leave our mark on the barrels - you never know where your adventures will take you! Now, Whistle Pig’s 12 Year Old World is in our top five favorites and always brings us back to this day. At the end of the day, enjoy the sunset views Waterfront Park has to offer of Lake Champlain. It’s the perfect spot to toast to the end of a trip and reflect on your favorite memories together.